Ambrose Evans-Pritchard has the right facts but the wrong cure in Don't go wobbly on us now, Ben Bernanke, an article detailing the problems in many US states, notably Illinois. Barack Obama's home state of Illinois is near the point of fiscal disintegration. "The state is in utter crisis," said Representative Suzie Bassi. "We are next to bankruptcy. We have a $13bn hole in a $28bn budget." The state has been paying bills with unfunded vouchers since October. A fifth of buses have stopped. Libraries, owed $400m (£263m), are closing one day a week. Schools are owed $725m. Unable to pay teachers, they are preparing mass lay-offs. "It's a catastrophe", said the Schools Superintedent. In Alexander County, the sheriff's patrol cars have been repossessed; three-quarters of his officers are laid off; the local prison has refused to take county inmates until debts are paid. Florida, Arizona, Michigan, New Jersey, Pennsylvania and New York are all facing crises. California has cut teachers salaries by 5pc, and imposed a 5pc levy on pension fees. This is not to pick on America. Belt-tightening is the oppressive fact of 2010-2012 for half the world. Hungary, Ukraine, the Baltics and the Balkans are already under the knife. Latvia's economy may contract by 30pc from peak to trough as it carries out an "internal devaluation", ie wage cuts, to hold its euro peg. The eurozone's fiscal squeeze is well advanced in Ireland. Brussels has told Greece to cut by 10pc of GDP in three years, Spain by 8pc, Portugal by 6pc. Britain must slash soon, or face a gilts strike. The Bank for International Settlements says Britain needs a primary surplus of 5.8pc of GDP for a decade to stabilise debt at pre-crisis levels, given the ageing crunch as well. The figure is 6.4pc for Japan, 4.3pc for the US and France. It warns of "unstable dynamics", posh talk for a debt spiral. "Action is needed now." The West risks a slow grind into debt-deflation unless central banks offset fiscal tightening with monetary stimulus – QE, of course – to keep demand alive. Yet the Fed and the European Central Bank are letting credit contract. So why has Bernanke broken ranks with King and begun to flirt with disaster by tightening too soon? Has he lost control to regional hawks, as in mid-2008? Have critics in Congress and the media got to him? Has China vetoed QE, fearing a stealth default on Treasury debt? Don't go wobbly on us now, Ben. If the governments of America, Europe, and Japan are to retrench – as they must – their central banks must stay super-loose to cushion the blow. Otherwise we will all sink into deflationary quicksand. More Quantitative Easing? Praising Mervyn King, the Bank of England's Governor? Has Ambrose Evans-Pritchard lost his marbles? In regards to Quantitative Easing, how many times do we have to prove it does not solve a thing? Hasn't Japan proven that for two decades? What does Japan have to show for it? The answers to those questions should be obvious but obviously they are not. Proof is in the title to Prichard's post "Don't go wobbly on us now, Ben Bernanke". 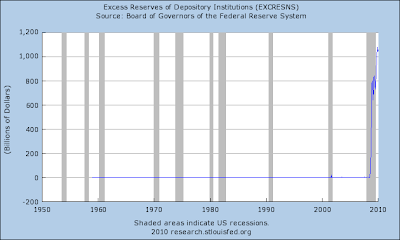 Please consider the following chart on excess reserves. There is already over $1 trillion in "excess reserves" sitting around that theory (wrong theory) suggests banks could lend. Pray tell what difference would it make to bank lending if excess reserves was 3 times that or even 10 times that? Quantitative Easing (QE) is useless. All it does is complicate exit strategies down the road. The problem is debt. Illinois is swamped in it. So is California, New Jersey, New York, and for that matter nearly every state in the union. Consumers are swamped in debt as well. Businesses have no reason to borrow. What states need to do is live within their means. To do so requires lower union wages and benefits, and the end of defined benefit pension plans for public workers. There simply is no other way. Consumers are too tapped out to support tax hikes for union parasites. More federal stimulus will result higher debt levels and more bridges to nowhere. On the QE side of things, Bernanke can make any amount of money he wants available for lending and it will not do a thing. Banks are too capital impaired to lend, and credit worthy consumers and businesses do not want to borrow. I have talked about this on many occasions, most notably in Fictional Reserve Lending And The Myth Of Excess Reserves, something that monetarists believing in QE ought to read. Ambrose Evans Pritchard, Paul Krugman, Joseph Stiglitz and scores of other economists all think it is possible to spend one's way to prosperity. Simple logic would suggest the idea is nonsense. Moreover, in practice it has failed every time. Greenspan tried stimulating the economy by holding interest rate low, and all he accomplished was creation of the biggest global housing bubble and debt bubble on record. Japan is proof as well. Japan tried both Quantitative Easing (a Monetarist policy), and Fiscal Stimulus (a Keynesian policy). Both failed (which is what one should expect following a collapsed debt bubble) and all Japan has to show for it is debt to the tune of 200% of GDP, with an aging population now needing to live off savings. Sadly those savings were squandered building bridges to nowhere. Yet, there is no end in sight to Japanese deflation. I do not know why economists believe in fairy tale economics and free lunches when the average 6th grader would know better. The only theory I can come up with to explain this phenomenon is a renewed outbreak of the Fiscal Insanity Virus rapidly spreading the globe. Ambrose Evans-Pritchard is no doubt, infected.